With a desire to get a few fish on the score board and try out a new spot Graham , Mike and I decided to head down the coats again in the hope of getting onto a few big fish. 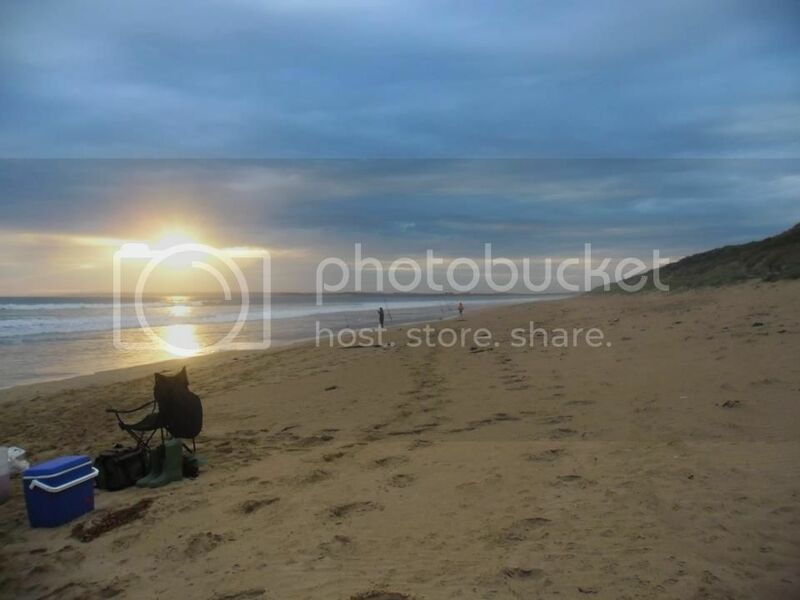 We had planned on getting down on the beach at low tide to check out the formations of the beach and to also make sure that we wouldn’t be battling to too much swell and weed due to the current run of southerly wind conditions. As I mentioned none of us had fished this beach before but another stalwart from the club and a veteran of the beach scene Alan had, based on his feedback and a bit of discussion we decided that the eastern side of the beach toward the reef was the most likely spot to give us a chance of snagging something. Graham had also scoped out this area and with the prevailing southerly was wanting to get over on the reef and fish with a bobby cork in the hope of getting into a few Salmon. The plan was to use his Carp rod mated up with a threadline and cast to the leeward side of the reef and float the baits above the snags. All was going to plan and he had a good take but as luck would have it the fish still took the float into the rough. 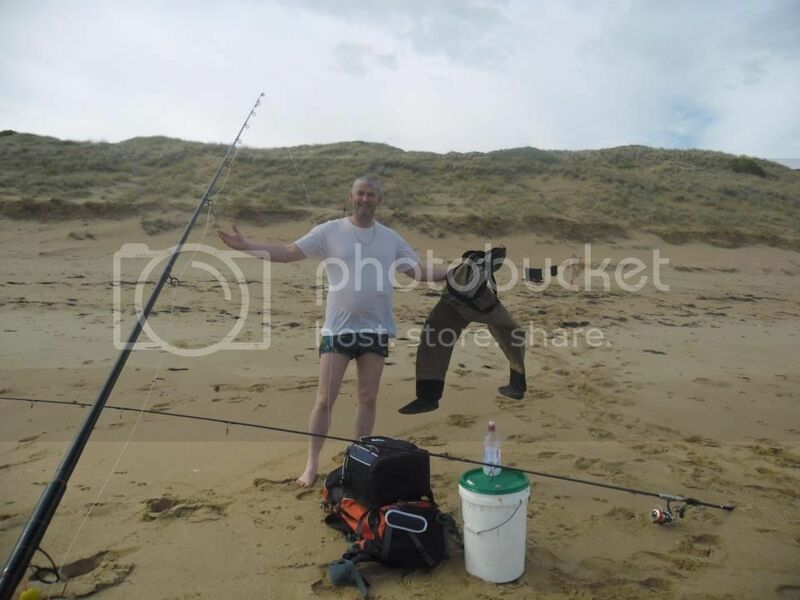 Whilst trying to extricate the fish and float from this he had to get down towards the water, sadly it was at this time that a large wave from the other side decided that he needed to take a shower . Also as expected the fish that started this also got away. After the shower Graham’s thoughts were to get back onto the beach and get dry first and also to get a bait into the water in the hope of picking up a few fish. The fishing was slow as would be expected with the low tide situation and it wasn’t until the sun started to set and we had the run in tide moving water through the gutter that we were fishing. Bait of choice was White bait , Pilchards , fresh calamari and some mullet. 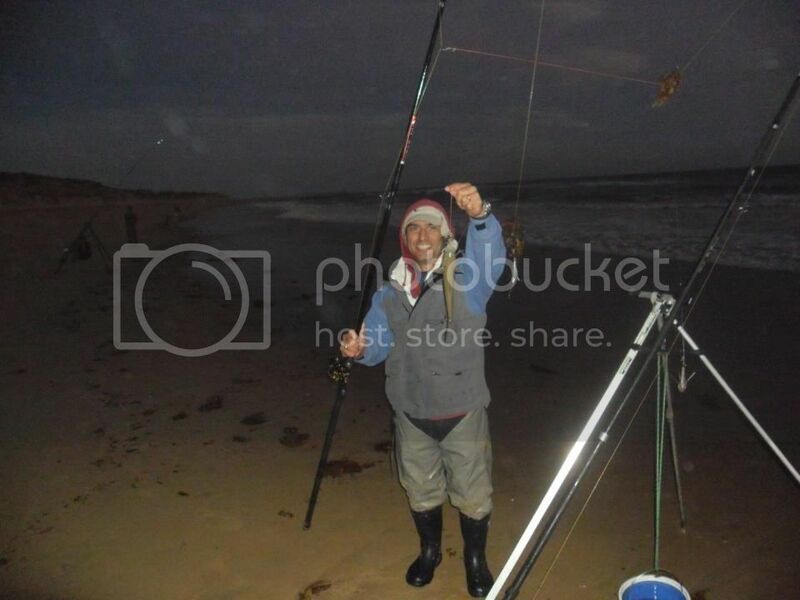 As it worked out the top bait was the calamari cut into thin strips and worked on 1/0 circle hooks. 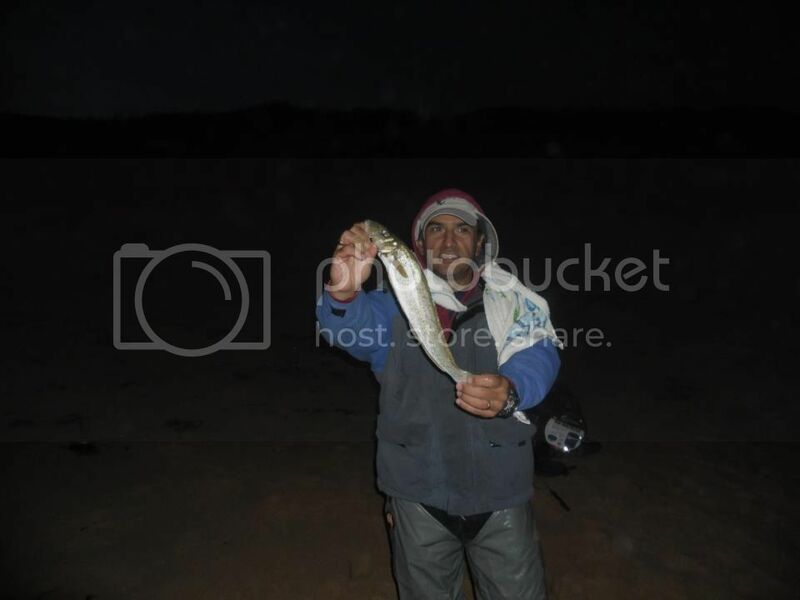 I was the first into a fish with a good sized King George whiting coming in which was soon followed by a small Pinky. 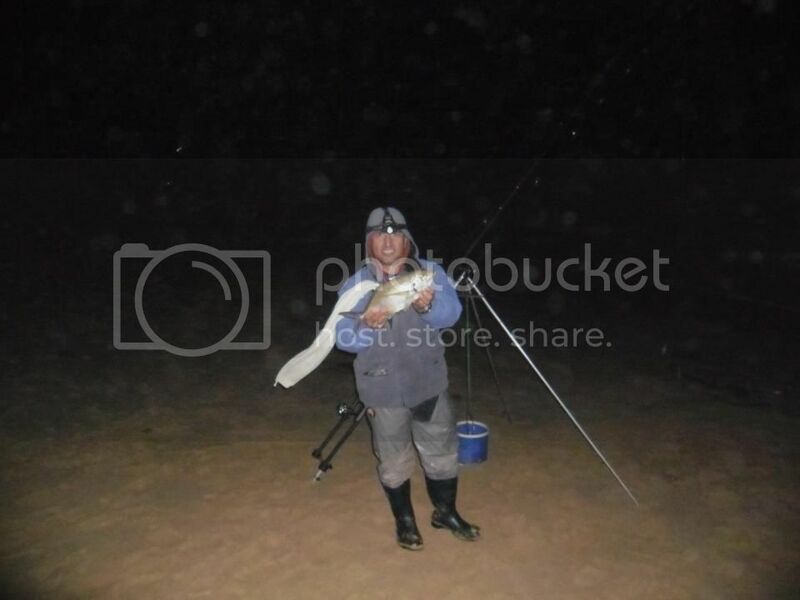 The bites weren’t coming in as fast as we would have assumed given that both of these are schooling fish, though Graham also nailed a small one on a large Pilchard rigger on a 6/0 twin hook rig. As the session progressed I was also pleasantly surprised with a nice sized Trevally. It’s been a while since I have taken on of these from a beach to any size and it was a pleasant addition to my bag as I like the eating quality of them . After this short burst of activity the tide was coming in strong and fast with a strong rip running along the beach , sadly it also brought along a large amount of weed that soon saw Alan and I deciding that it would be more productive to pack it in and head home. Graham and Mike decide to see out the run in with the hope that the weed would clear and give them a shot at something a bit better than what we already had. Post event catch up showed that this wasn’t to be and they to had to throw in the towel against the weed monsters. It was however a well worthwhile bit of change and a beach that we will hit again soon. Till next weekend if I can get some time .